Three crew members from the International Space Station returned to Earth on Friday. The landing in Kazakhstan wrapped up a space mission that lasted 141 days and returned samples from several NASA human research experiments aboard the station. Expedition 45 flight engineers Kjell Lindgren of NASA, Oleg Kononenko of Roscosmos (Russian Federal Space Agency) and Kimiya Yui of the Japan Aerospace Exploration Agency (JAXA) touched down at approximately 8:12 a.m. EST (7:12 p.m. Kazakhstan time) northeast of the remote town of Dzhezkazgan in Kazakhstan. It was the first time a crew has landed after sunset and only the sixth nighttime Soyuz return from the space station. As they adjust to gravity after their stay in space, Russian recovery teams will help the crew exit the Soyuz vehicle and load them into waiting helicopters for return flights home to NASA’s Johnson Space Center in Houston and the Gagarin Cosmonaut Training Center in Star City, northeast of Moscow. The trio arrived at the station July 23 and orbited Earth 2,256 times, traveling a total of 59.6 million miles. 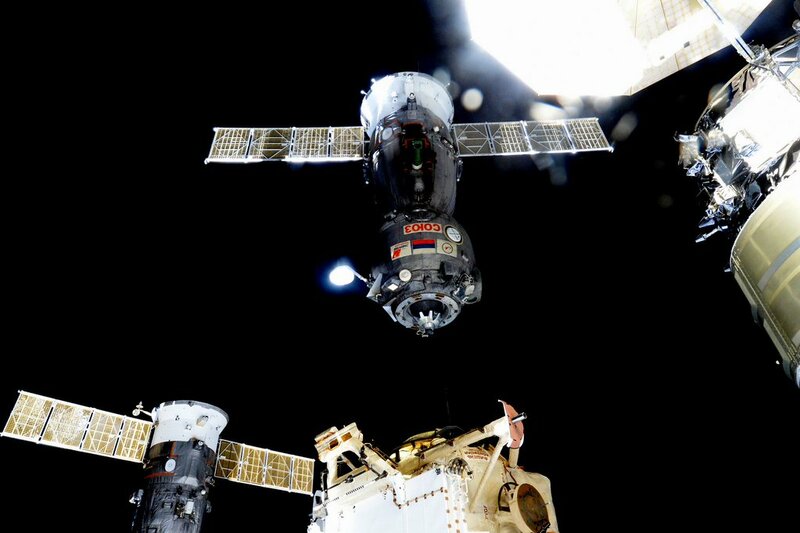 It was the first mission for Lindgren and Yui and the third for Kononenko, who has now spent 533 days in space. While aboard the orbiting laboratory, the crew members participated in Earth observations and conducted research in the areas of physical, biological and molecular science to advance knowledge and demonstrate new technologies. Such investigations enable research breakthroughs and drive technology innovations that provide benefits on Earth, and will enable long-duration human and robotic exploration missions into deep space. The space station is a test bed to demonstrate new technologies, and Lindgren and Yui took part in the Veggie plant growth experiment that yielded fresh lettuce for crew consumption in August. NASA is maturing Veggie technology aboard the space station to provide future pioneers with a sustainable food supplement — a critical part of NASA’s journey to Mars. The crew members welcomed three cargo spacecraft during the mission: the fifth Japanese HTV in August, a Russian ISS Progress in October, and Orbital ATK’s Cygnus, which arrived at the station Wednesday. During his time on the orbiting complex, Lindgren ventured outside the confines of the space station for two planned spacewalks. The first included a variety of station upgrade and maintenance tasks, including routing cables to prepare for new docking ports for U.S. commercial crew spacecraft. The second spacewalk resulted in the successful reconfiguration of a space station ammonia cooling system. The Expedition 46 crew members remaining aboard to continue research and maintenance are Commander Scott Kelly of NASA and Russian cosmonauts Mikhail Kornienko and Sergey Volkov. The three-person crew will operate the station for four days until the arrival of three new crew members. NASA astronaut Tim Kopra, Russian cosmonaut Yuri Malenchenko and Tim Peake of ESA (European Space Agency) are scheduled to launch from Baikonur, Kazakhstan, on Dec. 15.